At an exclusive launch event held at the iconic Grand Palais, Huawei Consumer Business Group unveiled themuch-anticipated HUAWEI P20and HUAWEI P20 Pro. The HUAWEI P20 Profeatures the world’s first Leica triple camera and both devices include unprecedented AI advances,combining technology and art to bring to lifeagroundbreaking smartphone experience. Achieving DxOMark’s highest overall scores,the HUAWEI P20 Series includes advanced, intelligent camera systems that bring consumers features that ultimately enhance every part of the smartphone photography experience. Ultimate performance, featuring the NPU onKirin 970and EMUI 8.1 based on Android™ 8.1 for a premium and smooth user experience. The HUAWEI P20 Series features a striking, fashion-forwardaesthetic. 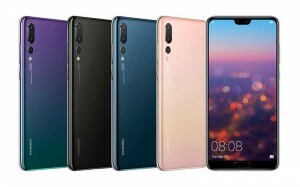 Most notably, the HUAWEI P20 and HUAWEI P20 Pro come in all-new, exclusive, fashionablecolors, Twilight and Pink Gold, achieved by applying several layers ofNCVM*optical coatings underneath the glass back, so light hitting the surface refracts and creates a vivid, yet gradual change of hue. The HUAWEI P20 and HUAWEI P20 Pro are also available in Black and Midnight Blue. The 5.8-inch screen HUAWEI P20 and 6.1-inch screen HUAWEI P20 Profeature ultra-thin bezels and impressive screen-to-bodyratios for better viewing experiences with more on-screen information, whether reading or gaming.The HUAWEI FullView Display seamlessly blends with rounded edges, making the device comfortable to hold. The HUAWEI P20 Series reflects the art of light, with camera features that enhance the smartphone photography experience. The HUAWEI P20 Pro features a Leica triple camerawith the highest totalpixel counton a smartphone available in the market – the camera configuration is comprised of a 40MP RGB sensor,a 20MP monochrome sensor and an 8MPsensor with telephoto lens. It also features a color temperature sensor for better color reproduction.With f/1.8, f/1.6 and f/2.4 wide aperture to capture crisp, clear details, the HUAWEI P20 Pro also includes a brand new Leica 3x telephoto (VARIO-SUMMILUX-H 1:1.6-2.4/27-80ASPH) lens for long-range photography of up to 5x Hybrid Zoom.The HUAWEI P20 Pro’shighly sensitive image sensor captures low light photos with up to ISO 102400. The HUAWEI P20 builds on its predecessor’s foundationwith aLeica dual camera featuring a 12MP lens with a pixel size as high as 1.55 μm, and a 20MP monochrome lens, enhancing the HUAWEI P20’s ability to capture photos in low-light settings. The HUAWEI P20 Series devices support six-axis stabilization and 960fps super slow motion, which is 4x higher than the standard 240fpsand captures details that cannot be seenwith the naked eye.With Ultra Snapshot mode,the devices can capture an image in as little as 0.3 seconds by just double clicking the down volume button,even from an offscreen. With the Kirin 970 processor, the HUAWEI P20 Series automatically identifiesmore than 500 scenariosin 19 categories and selects photography modes and camera settings to deliver incredible, professional-looking images – even for novice photographers.In addition, HUAWEI AIS steadies handheld night shots for incredible long exposureimages without a tripod. Brand new to Huawei’s advanced camera system is 4D predictive focus.In this mode, the camera predicts moving objects and focuses on them with extreme efficiency to capture minute details of objects in motion. In addition, the HUAWEI P20 Series features AI-Assisted Composition, providing intelligent suggestions to frame group shots and landscapes. The HUAWEI P20 and HUAWEI P20 Pro feature a 24MP selfie camera** with AI beautification and 3D portrait lighting – the result is beautiful selfies with healthy-looking skin tone adjustments, delicatelyoutlined facial details and realistic 3D feature enhancements. In partnership with Google, the HUAWEI P20 Series supports Google ARCoredelivering advanced AR capabilities. The PORSCHE DESIGN HUAWEI Mate RS combines Porsche Design’s signature brand aesthetic with Huawei’s mobile engineering expertise setting a new standard in luxury smartphones.The PORSCHE DESIGN HUAWEI Mate RS features a Leica triple camerawith the highest total pixel counton a smartphone available in the market – the camera configuration is comprised of a 40MP RGB sensor, a 20MP monochrome sensor and an 8MP sensor with telephoto lens. This is the world’s first smartphone equipped with microcapsule PCM – an aerospace cooling technology for maintaining a safe temperature. In addition, the PORSCHE DESIGN HUAWEI Mate RS features an innovative in-screen fingerprint sensor which allows consumers to wake up the device by floating their finger above the display, while touching the sensor to unlock the device is lightning fast. The back fingerprint sensor can also be used to unlock the device or to access a second, secure space. The 6-inch OLED 2K curved screen PORSCHE DESIGN HUAWEI Mate RS is available in Black, and for the first time, in an eye-catching Red***. Introduced on the HUAWEI Mate 10 Series, the HUAWEI P20 Seriesand PORSCHE DESIGN HUAWEI Mate RS feature TÜV Safety Certified HUAWEI SuperCharge. Both the HUAWEI P20 Pro and PORSCHE DESIGN HUAWEI Mate RS have a 4,000 mAh battery–the HUAWEI P20 features a 3,400 mAh battery– with AI-powered Battery Management. The PORSCHE DESIGN HUAWEI Mate RS is the first Huawei smartphone to enable quick wireless charging. The HUAWEI P20 Series and PORSCHE DESIGNHUAWEI Mate RS are immediately available globally. Huawei’s products and services are available in more than 170 countries, and are used by a third of the world’s population.Fifteen R&D centers have been set up in the United States, Germany, Sweden, Russia, India and China. Huawei Consumer BG is one of Huawei’s three business units and covers smartphones, PC and tablets, wearables and cloud services, etc. Huawei’s global network is built on almost 30 years of expertise in the telecom industry and is dedicated to delivering the latest technological advances to consumers around the world. Highest overall DxOMarkscores in the mobile camera category –HUAWEI P20 Pro: 109; HUAWEI P20: 102.